Navigate: StoreFront / Supplies for Earth Bottom Ponds & Lakes / Algae & Pondweed Chemical Control / Cide-Kick Wetting Agent, Activator and Penetrant - ALL IN ONE! Cide-Kick is used to enhance the effects of other liquid chemicals. Wetting Agent, Activator and Penetrant - ALL IN ONE! Cide-Kick is a by-product of the citrus industry, a low viscosity oil and is compatible with most aquatic herbicides and algaecides. Researchers have found that up to 70% of the effectiveness of a pesticide can be dependent on the spray application. 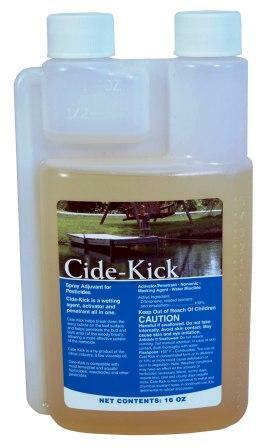 Cide-Kick increases the wetting, spreading, sticking, emulsifying, and dispersing of the herbicide. Cide-Kick helps break down the waxy cuticle on the leaf surface and helps penetrate the bud and bark area (of woody brush), allowing a more effective uptake of the herbicide. Cide-Kick is a by-product of the citrus industry, a low viscosity oil and is compatible with most aquatic herbicides and algaecides.